Toot toot! 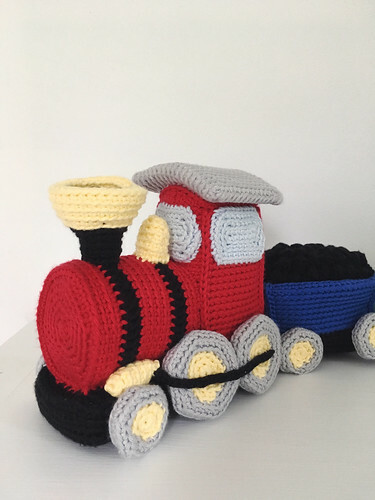 All aboard the Crochet Express! 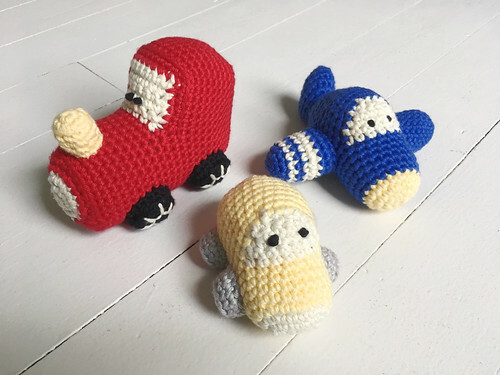 Today I have some crocheted baby gifts to share for a "planes, trains and automobiles" themed nursery. 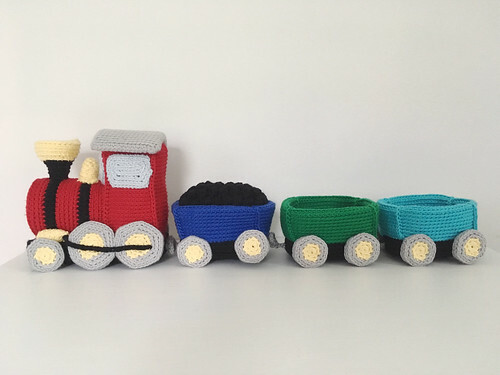 I made plane, train and car rattles from some ByMarika patterns. The patterns are great and work up quickly! I used Hobby Lobby's I Love This Cotton Yarn with a size F (3.75mm) hook, and added little rattle inserts. To keep it baby safe, I used french knots for the eyes. 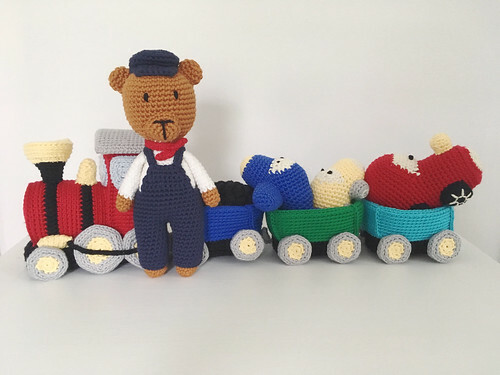 I found this incredible train pattern on Ravlery by Alyssa Voznak. There's a lot of assembly, but the end result is totally worth it. It's such a clever pattern, even using plastic canvas to help hold shape in certain places. I used Hobby Lobby's I Love This Cotton Yarn and a size E (3.5mm) hook. 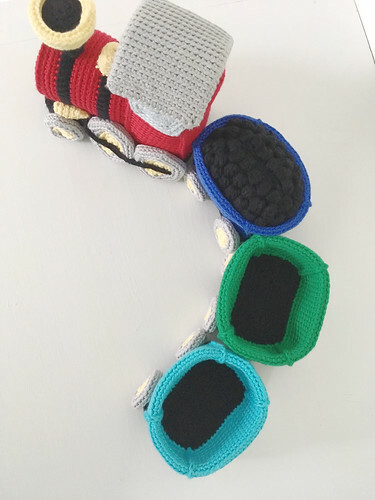 The only thing I changed to keep the toy baby safe was replacing regular buttons with crocheted "buttons" for the detachable car couplings. I think the coal car may be my favorite part! I do love a bobble stitch. 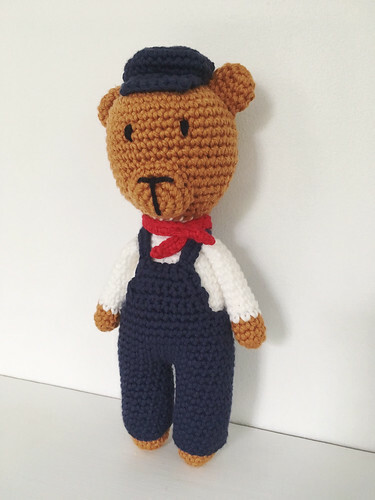 I made this conductor bear from my own pattern. (I first showed it here.) 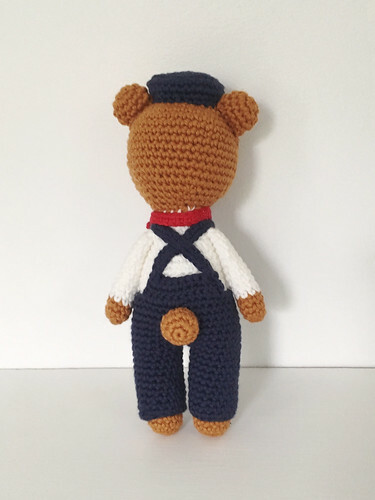 I made some overalls and a hat for him, and sewed them on so they can't be pulled off. I thought he turned out pretty cute! I'm hoping he looks like a conductor! From the back, I can't help but think his hat looks a little like a bell hop's hat... haha! SO adorable! That is one lucky kid! !